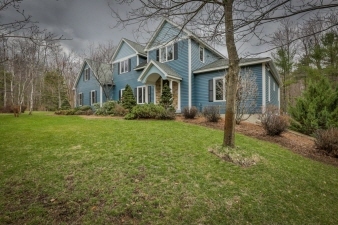 Warm & Inviting 5 Bedroom Colonial! Welcome home to this warm and inviting 5 bedroom Colonial. The beautiful custom kitchen features birch custom cabinets, granite counter tops, large island and Thermador appliances — gas cook-top with vent, double ovens, microwave, and all stainless steel. The living room features a beautiful stone corner gas fireplace and cathedral ceilings. Brazilian cherry hardwood in the formal dining room. 1st floor master suite with custom bath, jacuzzi tub and large custom closet. 1st floor office/den. The 2nd floor has 3 bedrooms with ample closet space and a family room with an additional game room or office space. The finished lower level consists of 4 great rooms to enjoy: living room with gas stove, gym, kitchenette, bedroom and 3/4 bath. Walk-out basement to a private patio with hot tub, deck and screened porch. Large yard for all your outside activities. 4 bedroom approved septic. This lovely home has too many features to list, make an appointment today!